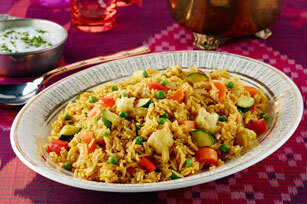 Biryani is a rice preparation cooked with curry - in our recipe, the cream cheese adds richness to this side dish. Bring 1 L (4 cups) water to boil in medium saucepan. Add rice; return to boil. Simmer on medium heat 7 to 8 min. or until rice is tender; drain. Spread onto rimmed baking sheet; cool slightly. Meanwhile, heat oil in deep large skillet on medium-high heat. Add vegetables, ginger, garlic and cumin seed; cook and stir 6 to 8 min. or until vegetables are softened. Stir in cream cheese product, tomato paste, seasonings and remaining water; cover. Simmer on medium-low heat 3 to 5 min. or until sauce is slightly thickened. Add rice to vegetable mixture; cook 3 to 5 min. or until sauce is absorbed and mixture is heated through, stirring occasionally. Remove from heat. Let stand 5 min. before serving. Prepare using 3 cups of your favourite combination of frozen chopped vegetables.